Ilander Heavy-Weights in Blue/White and Black/Plum. Jasen Gast with a monster 93-pound wahoo. Photo by REHAB Fishing Team. Bring home some winter wahoo this season with advice from these pros. 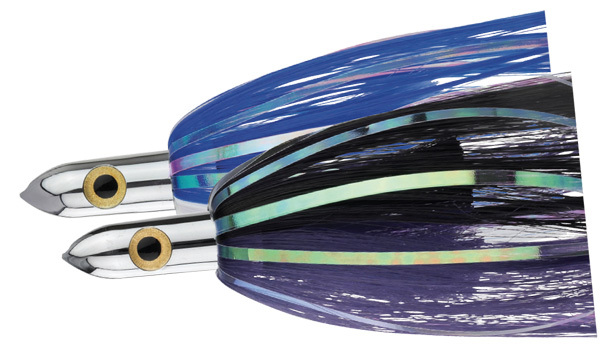 We run a split of Yo-Zuri Bonitas in purple/black and orange/black on the corners short and Ilander Heavy-Weights in black/red, black/purple and blue/white with ballyhoo long on the outriggers. The Bonitas are rigged on 275# 49-strand cable and the Ilanders are rigged on 175# cable with 9/0 needle eye hooks like the Mustad 7731AD or equivalent. This is not a live bait fishery, as the sharks are too thick. 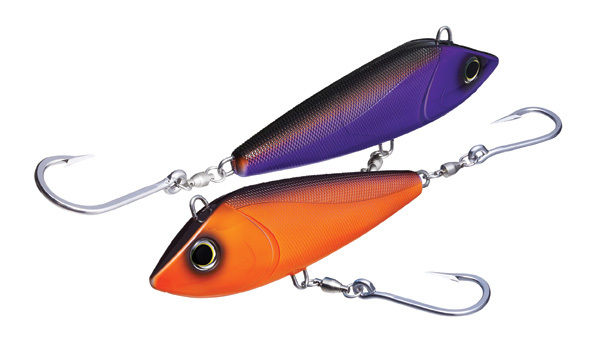 Stand up gear in the 30-pound class is the perfect tackle in our opinion. These rigs are light and fun, but still have enough strength for the occasional monster roaming out there. 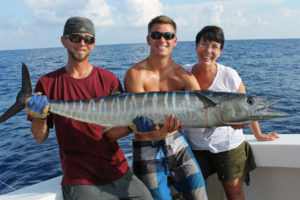 But, we do take the 50-pound gear along too, as they are appreciated when the wahoo are running big and for pulling bonitas on the shorts. Target the edge of the drop off, usually 160-200 ft. depths, but move around until you mark fish on the sounder and then stay on them. If you’re not marking well, don’t be afraid to troll wide and deeper looking for them. Every once in a while the wahoo will be shallower, but most of the time kingfish and barracuda are thick shallow on top of the reef. When you get a bite, keep the rest of the spread out. Many times you will get multiple hook-ups as the lures sink while you fight the fish. The best bite is usually very early in the morning but can be good in the evening too towards the later part of the day. 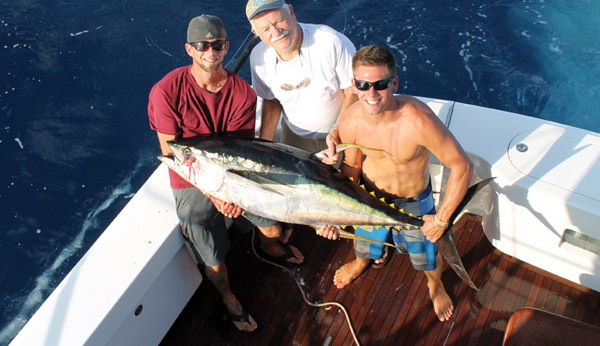 Although you are mainly targeting wahoo in January, be prepared to catch other species as well. 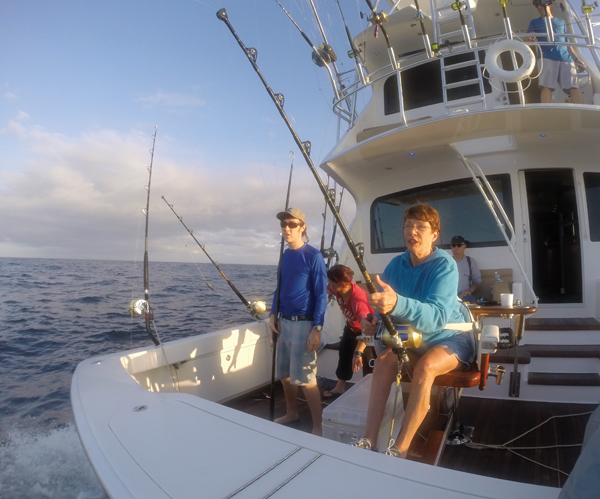 We have caught dorado, tuna and sailfish while trolling for wahoo. Yo-Zuri Bonita™ in Purple/Black and Orange/Black. I’ve always had my best results with Yo-Zuri Bonitas in purple/black or orange/black. Troll them fast at 10-12 knots. If fish are present they will be chasing bait. At the Flower Garden Banks, fish the up current side of the bank. The wahoo move through the current upwellings. Rig the Bonitas on six feet of multi-strand cable. 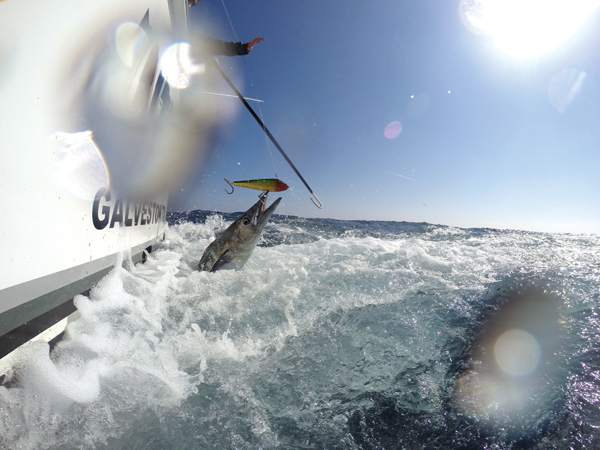 On the Legacy we always pullYo-Zuri Bonitas on the flat lines and drop one of them on the down rigger when the bite is slower. Orange/black and purple/black have always worked the best for me. 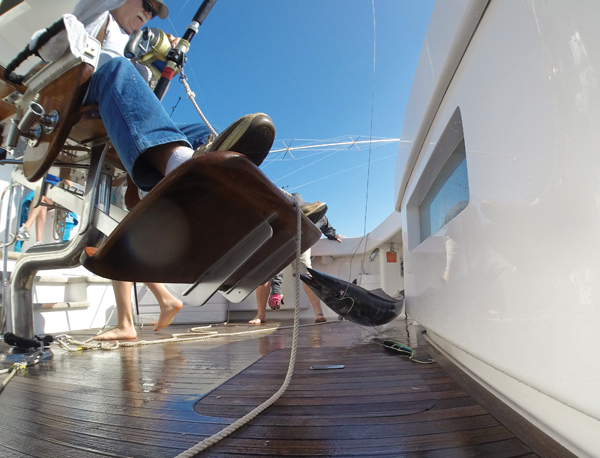 We pull weighted jet heads (not any particular brand) on the left and right riggers with an Ilander/ballyhoo on the center rigger. We pull mostly blue/white or pink/white Ilanders. We also keep a couple of spinning rods with large spoons ready to cast after we are hooked up. We have tried pitching live blue runners out after missing a bite or marking fish but sometimes ended up with big amberjack that are mixed in with the wahoo. When the bite is really on we try to keep it as simple as possible. 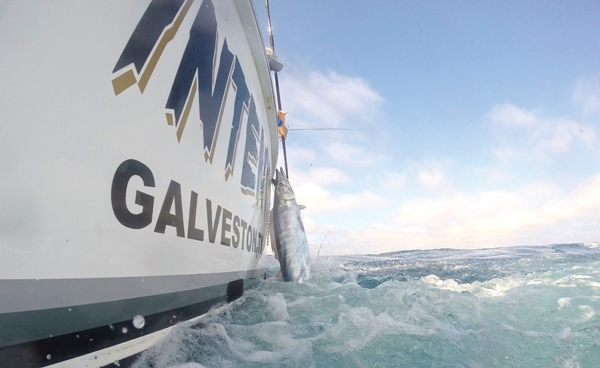 Bad Intentions returns home to Galveston after a tournament winning charter. Galveston offshore fishing at its finest! 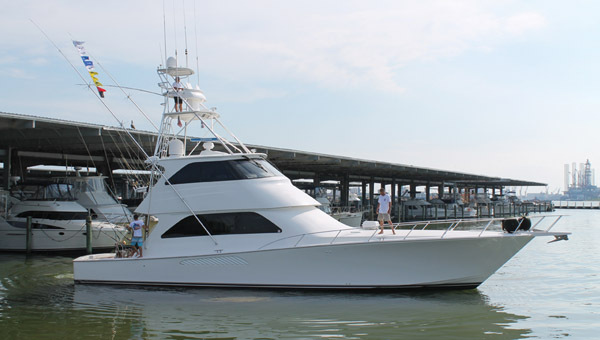 Bad Intentions, a tournament winning 64’ Viking sportfishing yacht, is now available for big game fishing charters out of Galveston, TX. 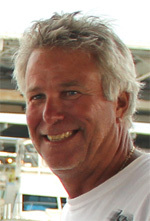 A group of six anglers can expect high action fishing for blue marlin, sailfish, dorado, wahoo and tuna. 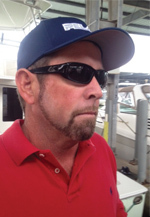 Bad Intentions is fully outfitted with the best, tournament level fishing setups, trolling lures and teasers. Tuna over 100 pounds are no stranger to the cockpit of Bad Intentions. 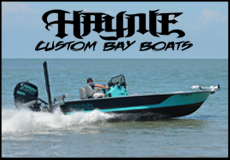 This serious fishing machine boasts a refined, comfortable interior as well. 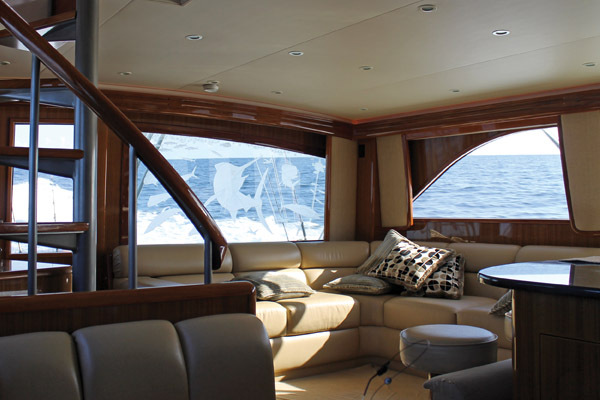 Bad Intentions is a 64′ Viking with enclosed flybridge, water and ice makers, plenty of cockpit seating and fish storage. 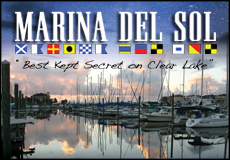 Fish one or more nights in comfort with AC, beds, showers, bathrooms and a fully stocked galley. 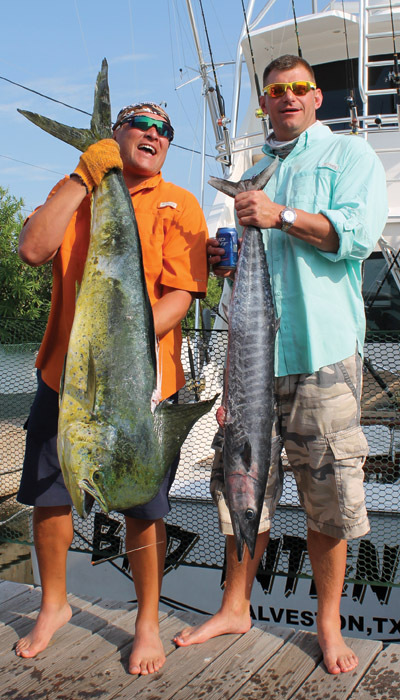 Bad Intentions Charters is a smart choice for birthday or bachelor parties, corporate retreats or for a group of die hard fisherman looking for the best Galveston offshore experience available. 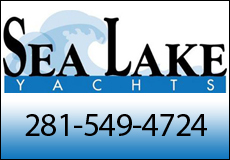 Charters are available year-round but ask about which times of year are best for your target species. 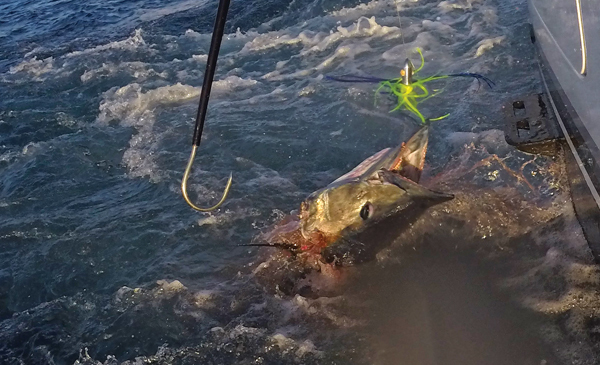 Get in the fighting chair and catch your fish of a lifetime! 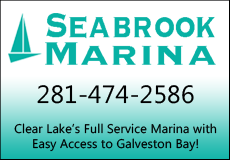 For pricing and information, call now at 409-737-9578 or 505-577-0385 or email flyrod99@gmail.com.